A septic system is an on-site recycling system which treats wastewater and returns it to groundwater. If properly designed, installed and maintained a septic system can do its work safely and efficiently for many years. Improper designing, installation, use and/or maintenance can lead to premature and costly failure. We encourage you to understand how your system operates, to use and maintain it properly to protect your investment and the environment. Below is a diagram of a typical septic system. Septic Tank: Waste water flows from the house to the septic tank. The tank is designed to retain waste water and allow heavy solids to settle to the bottom. These solids are partially decomposed by bacteria to form sludge. Grease and light particles float, forming a layer of scum on top of the waste water. Baffles installed at the inlet and outlet of the tank help prevent scum and solids from escaping. A properly functioning septic tank will release water, which has been separated from scum and sludge, to the leach field and will break down biodegradable products. 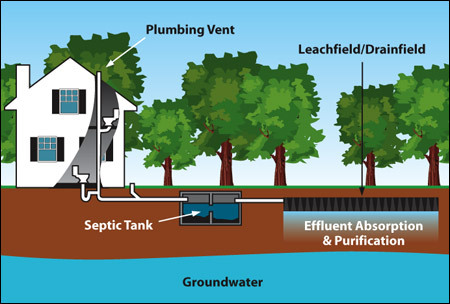 A properly maintained septic tank will not contain non-biodegradable materials; the sludge, scum and oils depths would be less than 1/3 of the liquid depth of the tank; the inlet and outlet baffles will be in place and appropriately sized; and the filter, if applicable, will be relatively clean and unobstructed. 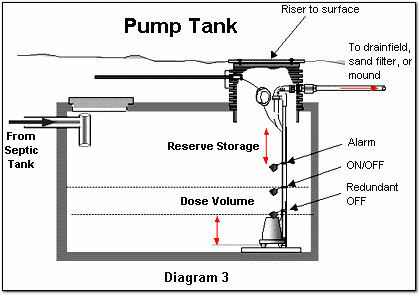 Pump Station: Systems where effluent cannot reach the leach field by gravity require pumping. This is achieved by a pump or siphon. A siphon does not require electricity and is used where the septic tank is above the leach field and static pressure forces the effluent to the leach field. An effluent pump requires electricity to operate. The siphon and pumps are located after the septic tank in a separate chamber. Where an effluent pump is utilized, on and off floats connected to the pump, trigger the pumpâ€™s operation. A third float triggers an alarm in the event the pump fails to turn on. The control box and an alarm are usually located in the house. Distribution Box: Most, but not all, systems have a d-box. 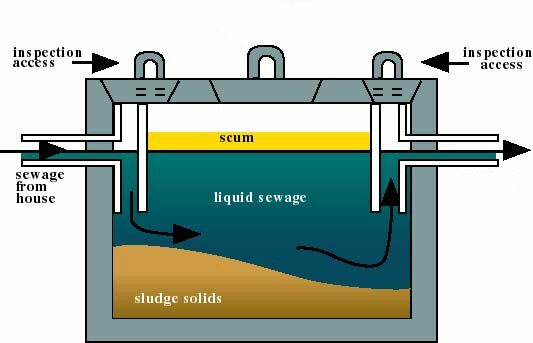 Once the effluent is separated in the septic tank, the distribution box, located in the leach field, dispenses the effluent into the leach field. 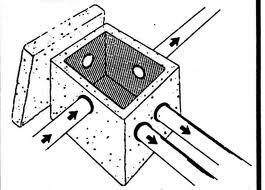 The distribution box should be laid level with the exiting pipes dispersing the effluent evenly into the lateral pipes with very little to no sludge content. Leach field: A solid pipe leads from the septic tank to the leach field where the waste water is channeled into one or more perforated pipes set in trenches or beds of gravel or a perforated concrete structure. Unlike the septic tank, the bacteria in the leach field require air to survive. Here the water slowly seeps into the underlying soil. Dissolved wastes and bacteria in the water are trapped or absorbed to soil particles or decomposed by microorganisms. This process removes disease-causing organisms, organic matter, and most nutrients (except nitrogen and some salts). The treated wastewater then either moves to the ground water or evaporates from the soil. Do not drive, park vehicles, or build sheds on the septic tank, d-box or leach field. These activities can crack pipes, cause the distribution box to settle allowing effluent to flow unevenly into the drain field, and/or compact soils suffocating the leach field.